Girl Kuripot Girl Kuripot: Win a Trip for 2 to American Idol! There are 3 ways to join. One is to buy at Greenwich and get a promo code, which you will send via text message or enter through a tab in their Facebook page. The second way, which I think no one has joined yet is to upload your video through another tab in their Facebook page. This is called the Wild Card entry. The third way is called an "on-ground contest", which I think has not been launched yet. I do agree with Boy Kuripot that one downside of this contest is that the mechanics are not clear. Another downside is that the prize inclusions are not clear. But don't let me stop you from joining and getting that chance to see your idol in Hollywood! =) The raffle ends on April 3, 2012! 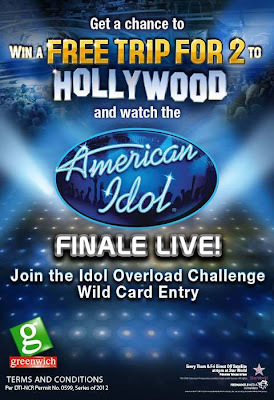 Click here to join the Greenwich Star World Idol Overload Challenge.